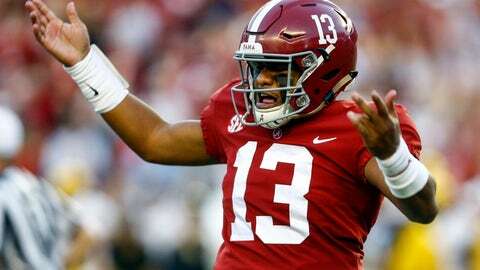 TUSCALOOSA, Ala. (AP) — Alabama quarterback Tua Tagovailoa aggravated a right knee injury on a run. Tagovailoa sprained his right knee last week against Arkansas but coach Nick Saban said he didn’t miss any practice time. Saban said Tagovailoa could have returned and wanted to. Wide receivers Henry Ruggs III and DeVonta Smith suffered apparent leg injuries. Smith didn’t return in the second half after a 57-yard catch. Ruggs appeared to have his right leg twisted by a Missouri defender on a tackle and walked to the locker room, but returned to the game. Smith pulled a muscle, Saban said, and could be questionable against Tennessee. Backup Jalen Hurts, who started the past two years, replaced Tagovailoa.